Planning a party? 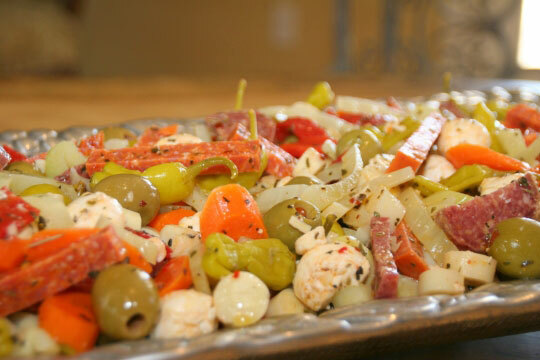 This colorful Antipasto Salad makes a great appetizer dish that will please your guests! The tasty combination of meats, veggies, cheese and pickled condiments are marinated in a dried herb garlicky, tangy, spiced marinade for a different flavor in every bite! Mmmmmm! I use Pepperoni and Genoa Salami in this recipe. You can substitute with your favorite dried salami’s and/or dried Italian Sausages. Be sure to stick to ones that are soft enough to slice and easy to chew for this salad. If you have never used Fennel it is on my list of top veggies that I always have in my refrigerator and grow in my garden. Some grocery stores will label it Anise. It has a licorice flavor with hints of celery and a feathery stalk that resembles dill. Like this recipe, I use the bulb of the fennel for soups, homemade stocks, and sauces reserving the stalks for salads, hashes, and as a topping for roasted veggies and potatoes. The taste of the fennel sweetens as it cooks. It makes a great addition to this classic Italian appetizer! There are many jarred items used in this recipe: Olives, Pepperoncini’s, Artichokes, Hearts of Palm and Roasted Bell Peppers (you can roast your own peppers at home). If you don’t find the exact jarred ingredient sizes try to find the closest possible. Have fun with this perfect “before meal” platter! Serve with thick slices of crusty bread and enjoy! This colorful Antipasto Salad is great for a party! The tasty combination of meats, veggies, cheese and pickled condiments are marinated in a dried herb marinade for a different flavor in every bite! Bring large pot of water to a boil. Blanch carrots and fennel for 3-4 minutes, or until they are crisp and slightly tender. Transfer to a bowl of ice cold water to stop from cooking. Let the vegetables cool then drain them well. Set aside. Place garlic, vinegar, basil, oregano, rosemary and red pepper flakes in a small mixing bowl. Slowly whisk in the olive oil. Sprinkle with salt and pepper to taste if preferred. Set aside. Toss carrots, fennel, red bell peppers, olives, artichoke hearts, hearts of palm, pepperoncini’s, mozzarella cheese, pepperoni, and salami in a large mixing bowl. Pour in marinade and combine. Cover and refrigerate for at least 6 hours or overnight. Serve antipasto in a large platter at room temperature.